April – Time for Exciting Heat Lovers! Recently night air temps have been steadily in the early 50s. Soil temps in the sun are now just 60. 60 to 65 are what we are looking for. Peppers especially need warmer temps, nighttime temps above 55°F and soil temps above 65°F. If planted too soon, sometimes they miss their natural sequence of production, and never produce. 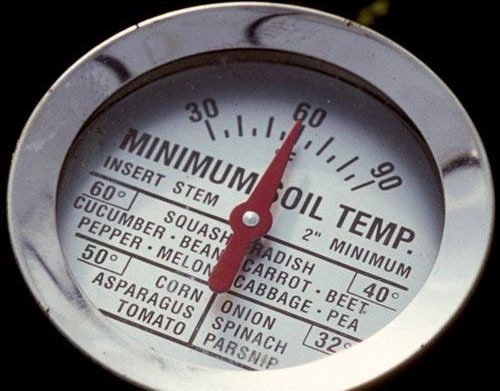 Best Planting Temps Per Veggie! APRIL! is true heat lovers time! Start MORE seedlings indoors NOW for successive June plantings. Sow seeds. If seeds and tending seedlings aren’t for you, get transplants and pop them in the ground per their right times! April 1 or as close to it as you can, start your Jicama seeds! Winter squash for sure. It needs time to grow big and harden for winter storage. MAY for cantaloupe, peppers, pumpkins and squash! Wait until the soil has warmed to 70°F before planting squash and melons. Many wait until May, some even June, to plant tomatoes to avoid soil fungi. Some gardeners wait until JUNE to plant okra. Okra really likes heat and grows quickly when happy. Choose faster maturing varieties for coastal SoCal. Long beans need warm temps to start from seeds. If YOU anticipate a HOT summer, plant a tad earlier, but be prepared to deal with it if summer is overcast as often is the case after all. It’s heat lovers time! Eggplant, limas, okra and peppers, pumpkins! Transplant early-maturing varieties of beans, cucumbers, eggplant, melons, peppers, squash, and tomatoes. Sow and/or transplant asparagus, beets, carrots, celery, chard, corn, herbs, kale, kohlrabi, leeks, heat-tolerant leaf lettuce, okra, summer-maturing onions, parsley, peanuts, the last peas (choose a heat-tolerant variety such as Wando), white potatoes with zucchini, radishes (with cukes to repel cuke beetles, and with eggplant to repel flea beetles), rhubarb, and spinach. Choose heat and drought tolerant varieties when you can. For example, why wait when it gets HOT and your tomato stops setting fruit?! Get heat tolerant varieties! Check out this nifty page of options at Bonnie Plants! Tomatoes are the Fireworks of Your Summer Garden! Tomatoes! Heirlooms are particularly susceptible to the wilts, Fusarium and Verticillium. Instead, get varieties that have VFN or VF on the tag at the nursery. The V is for Verticillium, the F Fusarium wilt, N nematodes. Ace, Early Girl, Champion, Celebrity, are some that are wilt resistant/tolerant. In Santa Barbara area continued drought conditions, consider getting only indeterminates. In the Mother Earth News tomato survey, they found gardeners chose heirlooms over hybrids if their soil is wilt/blight free. Otherwise, the longer the gardener has gardened, they more they chose wilt resistant toms if their soil has fungi. La Sumida has the largest tomato selection in the Santa Barbara area! See Special Planting and growing tips for your Tomatoes and Cucumbers! Time for heat-resistant, bolt-resistant lettuces of all kinds! Sierra, Nevada, Jericho, Black Seeded Simpson are some. Tips for super Successful Transplanting! Strengthen your garden! Remember, plan your Companions! Keep the biodiversity rolling! Plant pest deterring plants first so they will be up and working when you put in your or seeds or transplants! Basil is great with tomatoes, and a pack of culinary dandelions! Potatoes with Zucchini to repel squash bugs. Keep ’em coming! If you have already done some planting, mid to late April, schedule to pop in another round! Poke in some bean seeds where your very last peas are finishing, add cucumber seeds between the beans, plus dill at each end of the trellis to be there when you pickle your cukes! Plant more radishes to deter the Cucumber beetles, repel flea beetles. Fill in spots that could use a helper companion plant like calendula or chamomile. Succession planting makes such good sense. Put your seeds and transplants in at the same time. Seedlings will come along 6 to 8 weeks behind your transplants so you have a steady supply of yummy veggies! But, again, if tending seedlings isn’t your cup of tea, just leave space and put in more transplants in 6 to 8 weeks after your first planting. It is perfect to put in fast growers like lettuce, beets, turnips, arugula, to hold space until you are ready to plant bigger plants. When it’s time for the bigger ones, clear a space/harvest, pop in your seeds or transplants and let them grow up among the littles. As the bigger plants start to shade out the littles, remove lower leaves so the littles get light too! If you anticipate a HOT summer, plant littles on the morning light side of larger plants. Be wise and pick the right plant varieties for your temps and conditions! Get heat tolerant, bolt resistant, drought tolerant, disease tolerant/resistant. If you are just starting, just start! You will learn as you go. Our climate is changing, so we are all adjusting and plants will be being hybridized, and hybridize naturally, for new climates. We can get varieties from other areas that are already used to conditions we will be having. Together we will do this. Think biodiversity! Plant companion plants that repel pests, enhance each other’s growth so they are strong and pest and disease resistant. Mix it up! Less planting in rows. Split up groups so pests won’t go from one plant to the next, and the next. Allow enough room for air space between, no leaves of mature plants touching each other. That breaks up micro pest and disease habitats. Make top notch soil! Make compost. Grow worms for castings. In planting areas add tasty properly aged manure mixes. Add non-fat powdered milk for immediate immune system support at planting time; put in a finely ground bone meal for later uptake when your plant gets to flowering time. Sprinkle mycorrhizae fungi directly on transplant roots, all but Brassicas, at planting time to increase their uptake of nutrients and water. Harvest promptly. Insects and diseases know when plants are softening and losing strength as they age. Insects are nature’s cleaner uppers, and they and diseases are hungry! If leaves are yellowing or not looking up to par, remove them. Whiteflies are attracted to yellow. Prevention A frustrating typical spring disease is Powdery mildew. It’s common on late peas, Curly Leaf kales, broccoli. Plant leaving plenty of space for air circulation. Apply your baking soda mix. Drench under and upper sides of the foliage of young plants to get them off to a great start! Do this the same or next day if transplanting. A super combo is 1 regular Aspirin dissolved, a 1/4 cup nonfat powdered milk, heaping tablespoon of baking soda, a half teaspoon liquid dish soap per gallon/watering can. Reapply every 10 days or so, and after significant rains. Not only is prevention so much better than after mildew has set in, but this mix stimulates your plant’s growth! See Aspirin Solution. This California drought year consider planting IN furrows, where the moisture settles. Plant crosswise to the Sun’s arc so the plants’ root areas will be slightly shaded by the depth of the furrow in early AM and late afternoon. Make mounds with basins on top. Rather than losing water to evaporation from overhead watering, put the water right where it will do the most good and nowhere else. Make the mound to the dripline of your plant so small surface feeder roots get moisture for food uptake. For larger leaved plants, put a stake in the center of the basin so you know where to water. With a long watering wand you can water under the leaves rather than on them ~ unless they need a bath. And, PLEASE MULCH. It keeps your soil cooler, moister, less water needed. And it stops light germinating weed seeds! Plant littles like lettuces, a bit more densely, under larger plants to make living mulch. Dust Mulching, cultivation, weeding, is perfect to break up exposed soil surface. That keeps the water from wicking to the surface and evaporating. If you use a hula hoe you do two things at once! Just a half to one inch depth cuts off weed sprouts that use water. Indeed, it turns the soil a tad, all that’s needed. More weeds will follow, but it’s quick and easy to repeat the process. Two, three times, a few days apart, and there will be few weeds after that for awhile. Get ’em while they are small and easy to do. Smart gardening. Plant Bee Food, Herbs and Flowers! Sow or transplant basil, borage, chervil, chamomile, chives, cilantro, comfrey, dill, fennel, lavender, marjoram, mint, oregano, rosemary, sage, savory, tarragon, and thyme. Be mindful where you plant them… Mediterranean herbs from southern France, like lavender, marjoram, rosemary, sage, savory, and thyme, do well in hot summer sun and poor but well-drained soil with minimal fertilizer. On the other hand, basil, chives, coriander (cilantro), and parsley thrive in richer soil with more frequent watering. Wise planting puts chives by your broccoli, kale, but away from peas if you are still growing some. Cilantro, a carrot family workhorse, discourages harmful insects such as aphids, potato beetles and spider mites, attracts beneficial insects when in bloom. Dill is a natural right next to the cucumbers since you will use the dill if you make pickles. They mature about the same time. Let some of your arugula, carrots, lettuces, cilantro bloom! Bees, and insect eating birds and beneficial insects love them and you will get some seeds – some for the birds, some for you, some to swap! Grow beauty – cosmos, marigolds, white sweet alyssum – all benefit your garden in their own way! Please enjoy a few March garden images! Quick Guide to Summer Favorites Veggie Soil & Temp Preferences! Other Community Gardens – Wayside Chapel Edible Rooftop Veggie Garden! Events! Botanic Garden SPRING Plant Sale! CEC EARTH DAY Celebration 2017, Permaculture at Quail Springs! Keeping Your Veggie Garden Happy – Foliar Plant Care! Foliar plant care is so easy! Use a Dramm Can, the Perfect Foliar Machine! Worm Castings, Compost, Manure Tea, Fish Emulsion/Kelp for FEEDING – All in ONE! You can easily make this tea! A handful of castings, a handful to a cup of compost, handful of manure, stir and let them soak overnight in a bucket. In the morning, swoosh it around in the bucket one more time, let it settle, then pour the top liquid into your watering can, the one with the up turning rose. Add a Tablespoon Fish Emulsion/Kelp, mix, and drench your plants in the morning! Yum! Epsom Salts, Magnesium Sulfate, Your Solanaceaes, Peppers especially, and Roses! Sulfur, a key element in plant growth, is critical to production of vitamins, amino acids (therefore protein), and enzymes. Sulfur is probably the oldest known pesticide in current use. It can be used for disease control (e.g., powdery mildews, rusts, leaf blights, and fruit rots), and pests like mites, psyllids and thrips. Sulfur is nontoxic to mammals, but may irritate skin or especially eyes. Sulfur has the potential to damage plants in hot (90°F and above), dry weather. It is also incompatible with other pesticides. Do not use sulfur within 20 to 30 days on plants where spray oils have been applied; it reacts with the oils to make a more phytotoxic combination. Epsom Salts are easy to do! Buy some Epsom Salts, what you soak your feet in, at the grocery store, mix a tablespoon per gallon, foliar feed! Foliar feeding is simply sprinkling leaves with your solutions, and works better than applying to the soil! Get a Dramm 5 liter long snouted watering can that has a turnable sprinkler head. That long spout comes in handy, reaching well into your plant! Turn the head so the water shoots up under the leaves then falls back on the tops! The long arc of the handle gives lots of maneuvering ability! Feed your plants once when they bloom, and again ten days later. The results, attributed to magnesium in the salts, are larger plants, more flowers, more fruit, thicker walled peppers! I use this mix on all my Solanaceaes: eggplant, pepper, tomato, tomatillo. Roses love it too! Baking Soda & Nonfat Powdered Milk for PREVENTION! Add nonfat powdered milk to your Baking Soda fungicide! Powdered milk is a natural germicide, boosts your plant’s immune system! Apply right away on young bean plants, all your cucurbits – cukes, zuchs, any mildew prone plant. A 1/4 c milk in your gallon of water. Get under those leaves, early morning so the leaves dry and the habitat is less humid. Also add Salicylic acid, an aspirin to the mix! It triggers a defense response in tomatoes and other plants as well, and stimulates growth! One regular strength dissolved/gallon does the job. Healthy plants and abundant production are so rewarding! 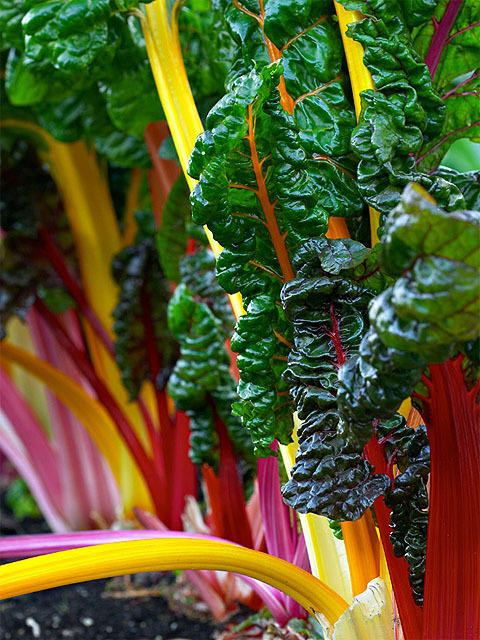 Just take a few minutes to give your plants a boost with these simple treatments! Whether Dramm, or another can, get yourself a good one! Make it easy to get up under those leaves! Otherwise, you are treating only 1/2 your plant! Getting Your Summer Garden off to a Vibrant Start and Keeping it Vibrant! To start, especially tomatoes, 4 things! First, throw a big handful of bone meal in your planting hole and mix it in with your soil. Bone meal is high in Phosphorous (for blooming) and takes 6 to 8 weeks before it starts working – perfect timing! It is also high in calcium, which helps prevent blossom end rot in tomatoes. Water regularly or it won’t help. Fine ground bone meal releases quicker, coarse ground lasts longer. Second, throw in a handful of nonfat powdered milk! It’s also high in calcium, that your plant can uptake right away, but more importantly, it is a natural germicide, and boosts your plant’s immune system!!! And what about tossing in some worm castings? They have special plant-growth hormones in the humic acids of the castings. 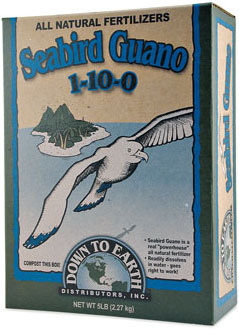 Sidedress them with seabird quano (NOT bat guano) that is high in phosphorus, stimulates blooms, more blooms! More blooms, more tomatoes! Foliar drench or spray with Epsom Salt mix – 1 Tablespoon/watering can. Fastest way to feed plant, and often the most efficient, is to foliar feed it. Epsom Salt, right from your grocery store or pharmacy, is high in magnesium sulfate. Peppers love it too. It really gives your plants a boost, and fruits are bigger, peppers are thicker walled. I drench all my Solanaceaes – toms, peppers, eggplant, potatoes, tomatillos – with Epsom salt. Some say apply 1 tablespoon of granules around each transplant, or spray a solution of 1 tablespoon Epsom salt per gallon of water at transplanting, first flowering, and fruit set. Fish/kelp mixes are for light feeding, are well balanced, but stinky, even when the fish emulsion is deodorized. If you want a more potent mix, use the hydrolyzed powder. Maxicrop is great stuff! Along the way, if leaves start yellowing, green ‘em up quick with emergency doctoring! Bloodmeal! It’s very high in quickly usable Nitrogen (N). Dig it lightly into the top soil, water well. Be aware, it and fish/kelp mixes are stinky and bring predators. Give everybody a little manure, dig into the top 6” of soil, but only on two sides of your plant. We want most of the near-the-surface roots to be undisturbed. Steer manure is cheap. Chicken stores in less space per what it can do, but it can be hot (burn your plants’ roots), so go lightly with it. Lettuces like manures. Compost is good stuff but sometimes not strong enough on N. Sometimes you can get FREE compost from the city. Again, indirect, but organic mulch not only keeps your soil cool, moist and weed free, but feeds your soil as it decomposes. Apply coarse mulch that decomposes slowly so it doesn’t use up your plants’ Nitrogen in the decomposition process. Well fed and maintained plants are more disease and pest resistant, are lusty and productive – they pay back with abundant larger tasty fruits and potent seeds for the next generation! Aphids/White Flies Season Keep an eye out for these critters in your broccoli, cabbages and kale. The simplest thing to do is spray ‘em with a jet of water from the hose, both topside and underneath the leaves! If the infestation gets beyond your tolerance, or the plant gets badly stunted or loses its healthy shape, remove the plant – don’t compost it. Don’t procrastinate on this because aphids/white flies spread quickly. This is one of the prime reasons to plant the same kind of plant in separate groupings or areas, rather than all in a row or a bunch, so the invaders can’t walk plant to plant. If you do that, plant them far enough apart so their leaf tips don’t touch, or keep them trimmed so they don’t. Keep a close watch! Prevention: Dilute 1 part nonfat milk, with 10 parts water. Spray liberally on affected plants. Do not spray on plants when in flowering stage. This treatment works so well usually one treatment is sufficient. See about research and more details at Appalachian Feet. Spraying milk on infected plant leaves with a solution of nine parts water to one part milk has shown to decrease powdery mildew by 90%. It has been reported that milk can boost the plant’s immune system, which also helps to fight powdery mildew and other diseases. Preventative/Cure: Baking Soda and Epsom Salt Remedy. Baking soda increases pH levels on the leaf surface which will makes it difficult for the fungi spores to survive. Foliar spray the plants liberally. Wash off after one or two days. 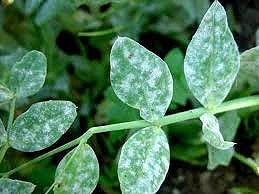 The solution will leave a white haze on the leaves of the plants which does looks similar to the mildew. Apparently it has been found that either the oil or the soda will do the job, but they do better together. However, one needs to test the oil first as some sorts of foliage can be damaged by it. If the mildew has already taken hold one can get rid of a lot of the spores and make the spray more effective by thoroughly hosing the leaves first. Milk & Baking Soda is the third possible combination used effectively! Your preference.